OSWEGO, NY – The Charles E. Riley Elementary School sixth grade honors assembly provided the opportunity to recognize those students moving on to Oswego Middle School while at the same time congratulating them for their academic effort. The Charles E. Riley Elementary School recently conducted its sixth grade ceremonies and Principal Dr. Linda Doty presented the Triple “C” Award to Matthew Oldenburg while teacher Cindy Farnsworth stands alongside Principals American Citizenship award winner Owen Warner. 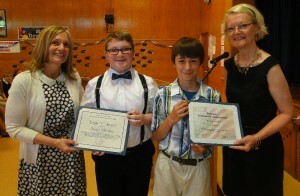 Along with the presentation of certificates were several individual awards including the “Principal’s American Citizenship Award” presented by CER Principal Dr. Linda Doty to Owen Warner. Dr. Doty also presented this year’s Triple “C” Award from the state attorney general for “character, courage and commitment” to Matthew Oldenburg. Several sixth graders were also recognized with the Presidential Awards for Excellence and received a certificate signed by President Barack Obama. Those earning the excellence honors included Megan Albright, Benjamin Caster, Alexandria Delfino, Molly Fitzgibbons, Miranda Gilbert, Olivia Henderson, Kayla Hockey, Sammi Jiang, Colin Li, Rielly Rozyczko, Owen Warner and Jacob Vickery. Students receiving the “achievement” award included Mackenzi Belson, Leandra Davis, Zachary Kingsley, Matthew Oldenburg, Estie Proano, Kalysha Rourke and Trevor Rousselle. A large sixth grade class was recognized by Principal Doty as well as their teachers Eric McCrobie and Cindy Farnsworth. This year’s students advancing to Oswego Middle School Megan Albright, Damien Allen, Lillian Alton, James Baker III, Mackenzi Belson, Madison Belson, Matthew Bonnell, Sara Boyzuck, Lauren Briglin, Benjamin Caster, Alexis Centrone, Julissa Davis, Leandra Davis, Christa Delaney, Alexandria Delfino, Logan Engle, Blake Fidler, Molly Fitzgibbons, Haley Gardner, Miranda Gilbert, Olivia Henderson, Jesse Hill Jr., Kayla Hockey, Sammi Jiang, Gabriel Jimenez, Natalya Jimenez, Destiny Kelley and Loretta Kelley. Also moving on were Zachary Kingsley, Emma Kozel, Katelyn Lagoe, Mia Lamphear, James Lee, Colin Li, Benjamin Martin, Matthew Oldenburg, Deizmend Perez, Joseph Powers, Estie Proano, Kalysha Rourke, Trevor Rousselle, Rielly Rozyczko, Faith Sams, James Tesoriero IV, Grace Verny-Rasmussen, Jacob Vickery, Owen Warner, Jacob Weigand, Gavin Weiss, Anthony Wilson and Tiffany Woods. Meanwhile, another highlight of the honors ceremony was the dedication of the yearbook to senior custodian Steve Quesnell.